In my article "How the internal arts work: Part 1" I discussed the issue of "dead time" as it occurs in natural stepping. I also alluded to it in my recent article: "Reversing momentum: "dead time" or useful tactic?". The topic of "dead time" is so central to my own martial theories, particularly those of the internal arts of China, that I thought it best to make this the subject of a dedicated article. After all, as I will explain in future articles, the internal arts go to great lengths to deal with "dead time" and other issues arising from natural stepping. Meanwhile practically every other traditional far eastern art also avoids natural stepping as much as possible, preferring what is known in Japanese as "yori ashi" ("okuri ashi" in kendo) and "suri ashi" - ie. shuffling steps where the front foot advances first, followed by the rear foot. Nor is this avoidance of natural stepping limited to eastern combat disciplines. Western disciplines like boxing avoid natural stepping just as much or even more. For example, boxing footwork utilizes a "skipping" action where both feet push off more or less together.1 Western fencing traditions also make use of lunges not dissimilar to far eastern fencing, with limited use of full, natural steps. But before I go any further, it is important to explain what I mean by "natural stepping". What I mean by "natural stepping"
"Natural stepping" is when you your back foot initiates movement. The back foot then passes the front, which in turn does the same, and so on. This is what you would do in your ordinary walking - say on a footpath. In Japanese this "natural stepping" is known as "ayumi ashi". Notably, ayumi ashi can be seen in karate basics practice where (particularly beginner) students will "walk" up and down the floor in traditional stances (most frequently zenkutsu dachi or forward stance but also every other stance) executing various hand and foot techniques. This is a very basic exercise designed to teach students the fundamentals of form and to condition their bodies. For this reason you see it in kata (forms), especially "beginner" forms such as the fukyugata/pinan series. 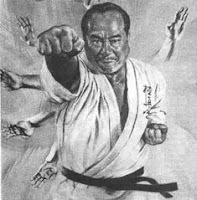 It should not be confused with tactics used in fighting (although it often is so confused, no doubt due to its ubiquitous presence in karate classes that are still largely faithful to the mass teaching model popularized in Japan just before and after World War II and later exported to the West). An example of "ayumi ashi" (natural stepping) in karate basic training. Note the lack of telegraphing by the front foot - one of the important kinaesthetic lessons to be learned from this practice. 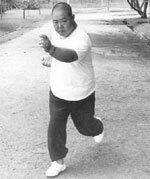 Natural stepping is also the bulk of what you do when walking the circle in the internal art of baguazhang. As with karate basic stepping, there are subtle (though important) differences in posture and weight distribution between bagua stepping and how you walk down the street. In some schools the manner of planting your front foot also changes: some schools plant the front foot flat rather than do a "heel - toe" action. This is known as "mud stepping" (which we don't do in Chen Pan Ling bagua). 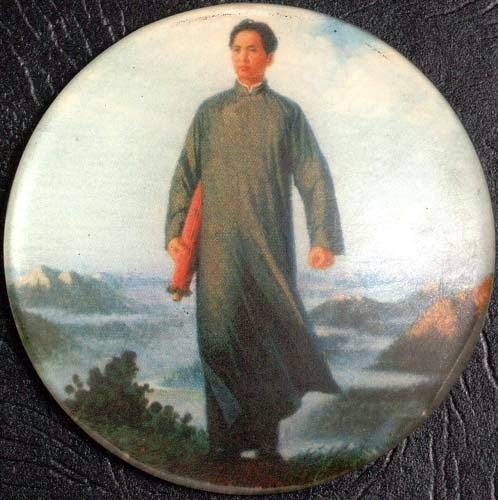 I will discuss bagua's use of natural stepping in "walking the circle" shortly and why, at the critical points of "change", it is abandoned. Suffice it to say that, for the present purposes, the back foot initiates movement and passes the front and that, in this sense, it falls within my definition of "natural stepping". 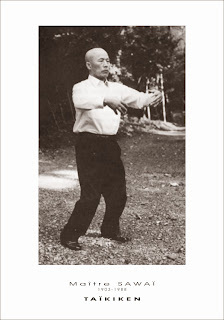 To a lesser extent, natural stepping can also be found in the taijiquan long form (albeit that it is usually mixed in with reversal of momentum). 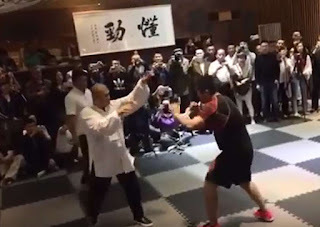 It occurs hardly at all in xingyiquan, but that is largely due to xingyi's focus on the "drop step" as the principal means of avoiding "dead time" (where taiji and bagua use turning and reversal of momentum instead - both of which can still be done with natural stepping to some extent). Again, I will cover the exact nature of the devices adopted by the taiji and xingyi in future articles. For now, let us go back to the core focus of this article, namely "dead time". What exactly do I mean by this expression? As I have noted previously, every time you take a natural step, there is a delay between the initiation of movement by your back foot and any real forward engagement of your core. Put another way, it takes a split second before you exert any forward force. This is necessarily because you are moving your back leg first. This split second is what I call "dead time". Take for example the picture to the above right. In it I am "walking the circle" in bagua, executing a natural step. My back (right) heel has started to lift in preparation for the step. At this point my body weight is still largely over my back foot and the lifting of my heel on that foot has not changed this situation to any appreciable extent. You will see from the picture to the above left that by the time my back foot draws parallel with what was my front (left) foot, my weight starts to become evenly distributed over both legs. As a consequence, there is still no real forward force being exerted. Indeed, my body hasn't really moved much off its vertical axis; such movement as there is can be measured in centimeters, not meters. It is only after what was my back foot passes my front (ie. when it passes the mid-line of my vertical axis) that I begin to "fall" forward (note the sudden blurriness of the last picture) and I begin to exert some forward force. Up to that point I'm really just setting myself up for a step. Since no real forward force is exerted during that "set up" time, it is "dead" for martial purposes. In order to understand just how "dead" it is, we need to compare it to the "drop step" where force can be exerted from the moment you commence stepping. The drop step is the very opposite of the natural step in that your front foot initiates movement not your back. When you lift your front foot you should notice something very different from natural stepping: you start to fall forwards immediately. There is absolutely no delay between your foot lifting off the ground and your forward force being exerted. This should be apparent from the blurriness of second of the adjacent images. Having lifted the front foot and stepped (or rather, lunged) forwards, you can proceed to slide the back leg up. Without this "slide up" it doesn't really qualify as a "step" - I tend to think of it as a mere lunge. If your back foot slides up to close the gap created by the front foot but never passes your front foot, this kind of stepping is called "yori ashi" in Japanese (or "okuri ashi" in the Japanese sport of kendo - fencing with split bamboo "shinai"). 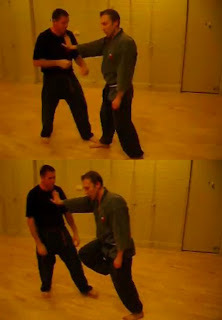 Some more basic stepping, this time using "yori ashi" or "okuri ashi" - a kind of shuffle step found in most martial arts both eastern and western. 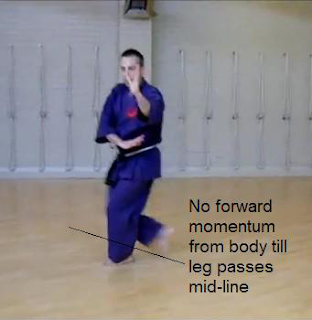 If your back leg ends up passing your front, this is called "suri ashi" in Japanese. This is the kind of "drop stepping" employed in the internal art of xingyiquan. "Suri ashi" - stepping that commences with the front foot but still involves the back foot passing the front. Regardless of whether or how you slide up your back foot, the important feature of this type of movement is that you initiate it with your front. As I have said, this means that you will instantly exert a forward moment with your whole body. Have a partner stand in front of at arm's length. Now place your hand on his or her upper chest and lift your front foot. Now don't just lift it, but project the foot forward. Next, repeat the same experiment with your back foot initiating the movement (as per a natural step). The difference should be quite marked. There is nothing really wrong with natural stepping. Indeed, it is essential for our locomotion precisely because it enables you to cover larger distances economically and effectively. Lunges and "drop steps" are not suitable for covering such ground, otherwise you'd see people doing it! But for distances such as those encountered in melee range fighting, the situation is reversed. You need to cover a distance of one to 1.5 meters at most in one go. And you need to be exerting a forward force from the "get-go". Even a split-second delay can be fatal. Once your opponent retreats and you are chasing him or her, then you will revert to natural stepping. The same applies if you are being chased. It is only then that issues such as the natural "sine wave" of a running gait become relevant. But natural stepping has no place in the short, furious bursts of the melee. Accordingly it should come as no surprise that natural stepping is not a significant part of any traditional fighting discipline or combat sport. You just don't have the luxury of time for natural stepping. So why is natural stepping seen in the forms of some traditional arts (eg. 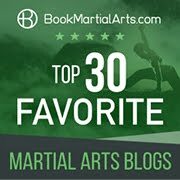 karate and bagua)? Put simply, the role of stepping in those forms is very specific: it is not intended to reflect a melee range exchange. Instead, the steps function to cover ground to get you into the melee range. The natural steps also function to put you into a dynamic context. In the case of bagua, the natural stepping sets up a rhythmic movement which you break by executing "palm changes". It is during these palm changes that the astute observer will note the almost complete absence of natural stepping - something that only resumes once the palm change is finished. 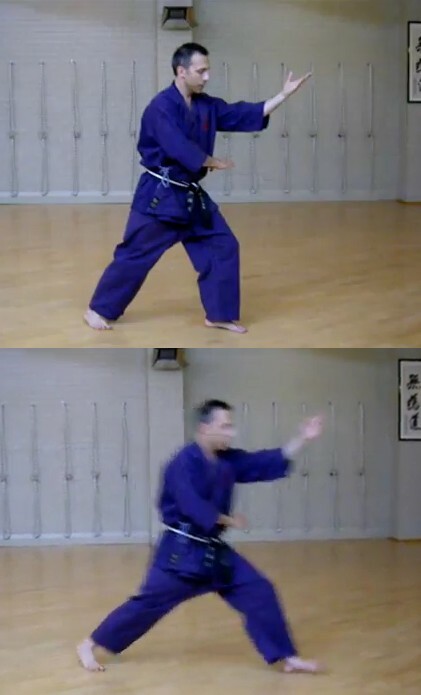 Such natural stepping that does occur is either "post drop step" or as part of a spiral (one of the ways in which bagua deals with over-extension). But that is a subject for another day. 1. The video below shows some basic footwork drills from boxing. You'll note that this footwork does not involve "natural stepping" but utilizes a kind of "skipping" motion which addresses the "dead time" factor. A video on boxing footwork. Note the absence of ""natural stepping". One of the things I've noticed with Taiji steps is that because peng or power must always be on, the moment someone puts weight unto a leg and that leg isn't touching the ground, he can be easily lifted into the air and thrown. Often into the air. 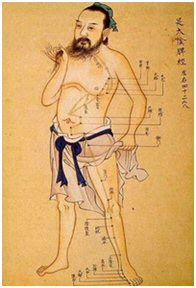 Without grounding or what the Chinese arts call rooting, there is no power. So it's not necessary for the taiji user to always exert power when moving, but they must at least be able to sink that power into the ground to prevent incoming force from disrupting their posture. That and the fact that because Chinese arts so often times attack the legs, it's often useful to move a leg off the ground, without moving the center of balance. This allows a person to choose whether they want to open the range or close the range with a counter kick/attack. Or if stepping, it's useful not to lean into the front stepping leg, as that creates an opportunity for a leg attack that is too fast for you to retract the targeted knee/ankle. Natural stepping is done quite often in western sword arts. Its known as a passing step. To eliminate dead time where there is forward motion without a presented threat we employ what george silver refers to as the three timings. The first timing is foot first, then weapon. The second timing is foot and weapon move at the same time. The third timing is weapon first, then foot. The first two timings are known as 'false time'. The third timing is the ideal and is known as 'true time'. By leading with the weapon and decoupling the motions foot and the hand you eliminate the dead time and minimise telegraphing. It takes a great deal of practice to perfect, but once its done its damn hard to stop, even at low speed. Thanks for that. Eastern fencing employs a similar strategy as does bagua, now that I think of it. The main thing is to addressing dead time when stepping, not just ignore it. Most fighting however takes place in the melee range where full stepping is not the bulk of the exchange imho. Thanks again. When in range it is more usual to use gather steps or accressare/Decressare similar to what you could call yori ashi to control distance. But cuts are often performed on the pass in order to correct the body structure as one moves from one guard (kamae) into another. Indeed, in any fight there will, sooner or later, be a situation where one foot passes the other (ie. where you have to take a natural step). Examples include where your opponent backs away and you have to close the gap or vice versa. Fighting methods must take that into account, and often do. So, for example, in the jian sword form that I practice (Chung Yang), natural stepping is accompanied by set up moves like jiao (a circular parry). This is subtly, but significantly, different from, say, karate basics, where a full step is made and only then is a technique (eg. 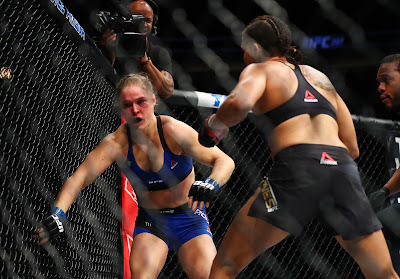 a lunge punch) performed. I was contrasting this practice in this article, rather than attempting to argue that full steps don't occur or aren't catered for at all in traditional fighting arts. From my (very) limited knowledge of Medieval swordsmanship, the German and English schools seem to advocate passing footwork (aka natural steps) to be used when launching attacks. I'd love to hear your thoughts on this! Thank you for your very interesting blog. 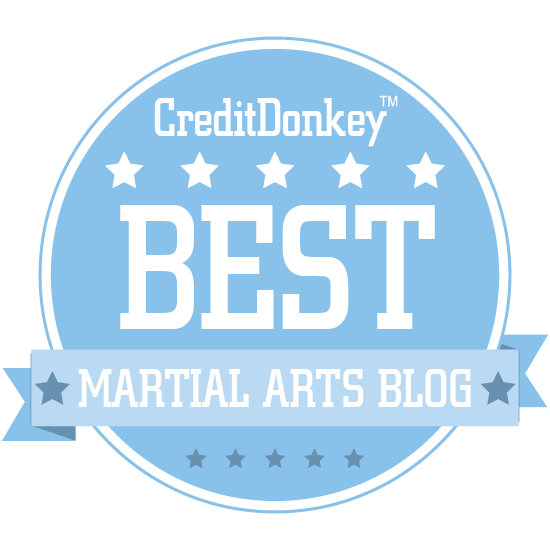 Your take on martial arts is refreshing and new. It seems to me that Bagua puts a lot of emphasis on this circle walking thing which accentuates the normal step (and not the slide step, or drop step, or any of the similar variations). This seems somewhat counterintuitive I think in a way (and somewhat against your article). Same can be said for karate steps. However, not the same can be said for example of boxing, xingyi and fencing (and quite a lot of other sword arts). So it seems to me that martial arts can be classified in 2 distinct classes: ayumi ashi based and yori ashi based. My question is: what is the advantage of pursuing an ayumi ashi based school instead of a yori ashi based school? It seems to me that by and large, the latter are a little bit better for fighting than the former. Hi Mike, thanks for your interesting question. Yes, bagua spends a lot of time in "natural stepping" (ayumi ashi). The reason for that is, I believe the same as the reason in karate and many other arts. I have covered the benefits of natural stepping in this article. That said, bagua's real functionality (ie. 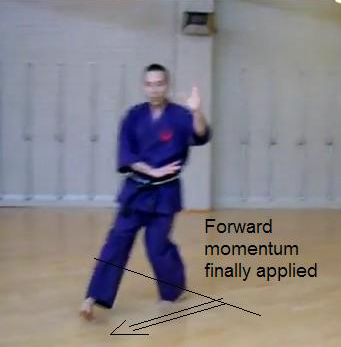 the principle that underlies its techniques) is not found in natural stepping. Yes, that stepping is important for conditioning and learning to minimise "dead time" when you (invariably) make a natural step. But this is just the start. The essence of bagua lies not in walking the circle (the movement), but in the changes to that movement. The true "magic" of bagua is that critical moment of "change". Everything hinges on that. This happens when your body reaches full extension or expansion. Bagua then converts that extension or expansion into a spiral (as I'll shortly detail) where xingyi will use a drop step and taiji will "retract" or "absorb". In this way the momentum is continued or "preserved" as I like to call it. Walking the circle is necessary to set up a paradigm. The change in that paradigm is what is important in bagua, not the paradigm you set up to facilitate that change. 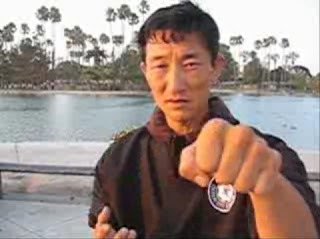 So even if you are walking the circle with no technique, the essence of bagua will be felt if you swap directions using bagua stepping principles. Until you do, you are simply exercising your thighs and other core stabilising muscles (which is useful, but is no different from karate, for example). 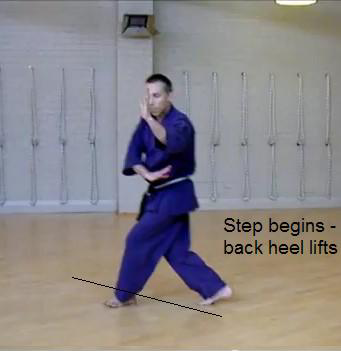 Xingyi also has natural stepping - except that it follows on from an initial "drop step". Arguably it is exactly "half ayumi, half yori" ashi. Bagua generally has 8 steps before a "change". But just as the essence of xingyi lies in the initial drop step, the essence of bagua lies in the spiralling change. The rest is "set up for practice". 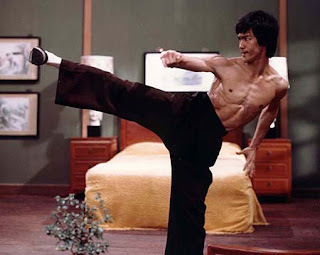 So it would be incorrect to say that xingyi is "half and half" or that bagua is 7/8ths natural stepping. This ignores the critical point that defines the art. Thanks again for your thought-provoking question.